1992, Joseph Young. 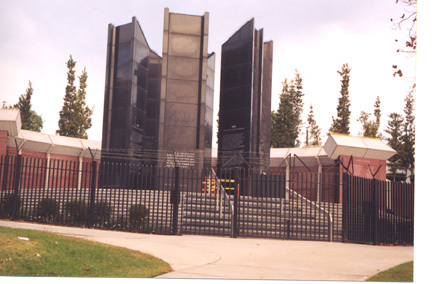 Pan Pacific Park, on the Beverly Boulevard side. Architect: The Nadel Partnership; Contractor: Goldrich & Kest and Prestige Homes. 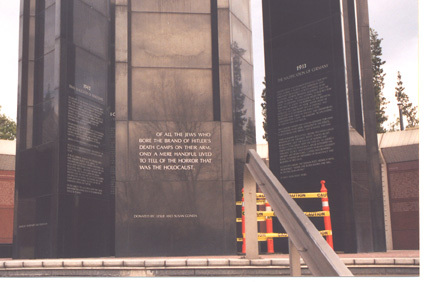 To honor the memory of six million, six 18 feet high columns of black granite will stand on a base of red granite. 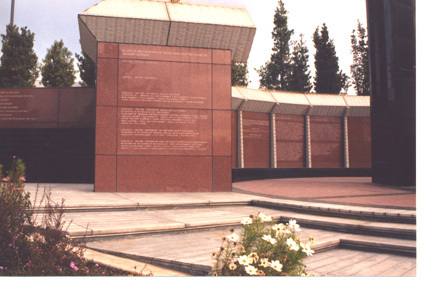 The triangular columns provide 18 panels on which the artist will integrate bronze bas-reliefs and inscriptions that depict the Holocaust Era from 1933 to 1945....The open space in the middle of the Monument symbolizes the "invisible" seventh column, which personifies all those who survived the Holocaust and pledged themselves to a better world. ".